The back cover of Marvel comics dated February 1980 featured an advertisement for Lego's Expert Builder Series. These vehicles were state-of-the-art at the time and represented the toy maker's earliest attempts with interconnected moving pieces and the Lego equivalent of hydraulics. 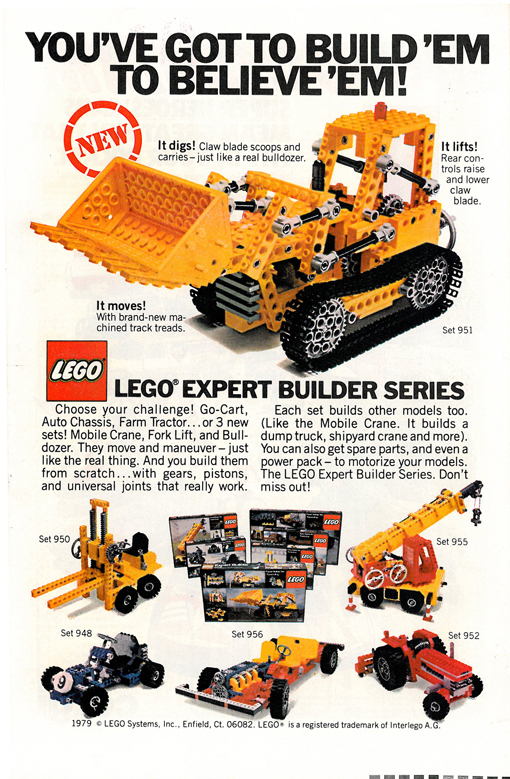 I seem to recall getting the bulldozer (Set 95) for my birthday when I was a kid and having a really hard time putting it together - especially the zillion pieces for the treads. Sure these sets are pretty elementary by today's standards, but they were very very cool at the time.